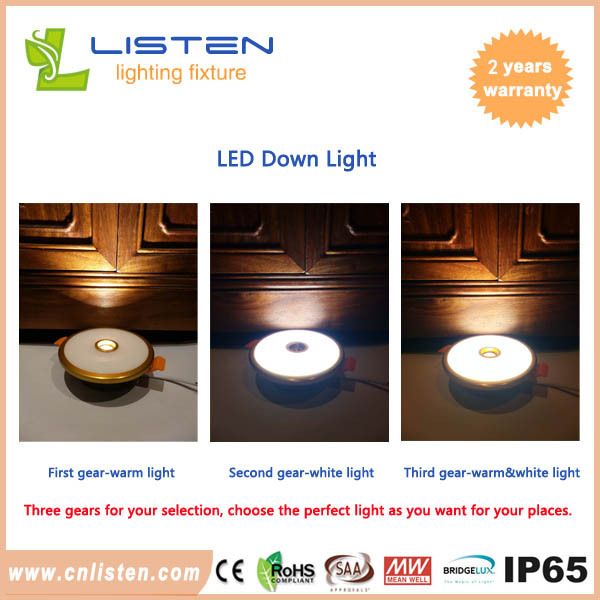 Product description: Three gears to choose the perfect lights for your options, first gear is warm light(3000K),the second gear is cool white(6000K),the third gear is warm light and cool white together. Three gears to choose the perfect lights for your options, first gear is warm light(3000K), the second gear is cool white(6000K), the third gear is warm light and cool white together. Suitable for many applications, including:track lighting,pendant lighting,desk lamps,landscape lighting and retail display lighting. Household, villa, restaurant, hotel, library, KTV, meeting room, show room, shop window, telephone cabinet, track light and so on. 1. Use super bright LED light source, with remarkable energy-saving effect. 2. High energy-saving: Saves more that 80% of electrical energy compared with incandescent lamp or halogen Bulb. 3. Lower temperature: The light emitted would not produce much heat no matter how long it was used. 4. Healthy light: No ultraviolet and infrared radiation. 5. Environmental protection: No any chemicals like mercury and lead, easily recycled, no electromagnetic disturbance. If you would like to know more about this product, please check http://www.cnlisten.com/en/news/video-for-led-downlights.html. After checking this video, you would know how this work. Listen Technology Co., Ltd. is one of professional manufacturers in the field of led lighting, producing LED lighting products such as led down lights, solar street light, led street light, led high bay light, led underwater light etc.